Deric's MindBlog: Socioeconomic status moderates age-related differences in brain organization throughout adulthood. Socioeconomic status moderates age-related differences in brain organization throughout adulthood. Work by Chan et al. (open source article) suggests that higher socioeconomic status (SES) may be a protective factor against age-related brain decline. An individual’s socioeconomic status (SES) is a central feature of their environmental surroundings and has been shown to relate to the development and maturation of their brain in childhood. Here, we demonstrate that an individual’s present (adult) SES relates to their brain function and anatomy across a broad range of middle-age adulthood. In middle-aged adults (35–64 years), lower SES individuals exhibit less organized functional brain networks and reduced cortical thickness compared with higher SES individuals. These relationships cannot be fully explained by differences in health, demographics, or cognition. Additionally, childhood SES does not explain the relation between SES and brain network organization. These observations provide support for a powerful relationship between the environment and the brain that is evident in adult middle age. An individual’s environmental surroundings interact with the development and maturation of their brain. An important aspect of an individual’s environment is his or her socioeconomic status (SES), which estimates access to material resources and social prestige. Previous characterizations of the relation between SES and the brain have primarily focused on earlier or later epochs of the lifespan (i.e., childhood, older age). We broaden this work to examine the relationship between SES and the brain across a wide range of human adulthood (20–89 years), including individuals from the less studied middle-age range. SES, defined by education attainment and occupational socioeconomic characteristics, moderates previously reported age-related differences in the brain’s functional network organization and whole-brain cortical structure. Across middle age (35–64 years), lower SES is associated with reduced resting-state system segregation (a measure of effective functional network organization). 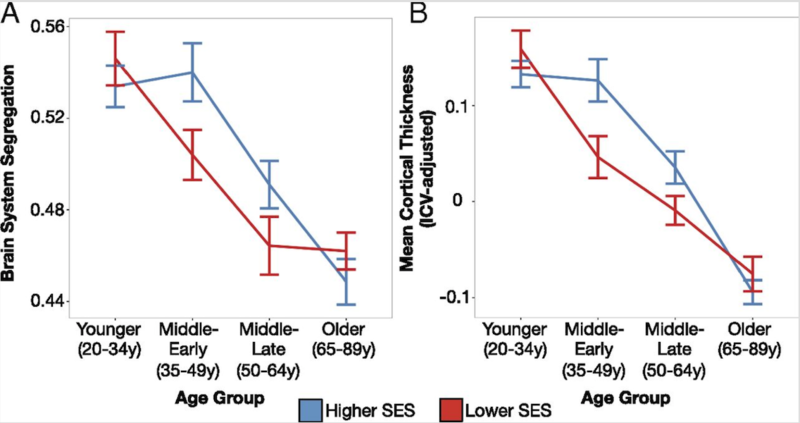 A similar but less robust relationship exists between SES and age with respect to brain anatomy: Lower SES is associated with reduced cortical gray matter thickness in middle age. Conversely, younger and older adulthood do not exhibit consistent SES-related difference in the brain measures. The SES–brain relationships persist after controlling for measures of physical and mental health, cognitive ability, and participant demographics. Critically, an individual’s childhood SES cannot account for the relationship between their current SES and functional network organization. These findings provide evidence that SES relates to the brain’s functional network organization and anatomy across adult middle age, and that higher SES may be a protective factor against age-related brain decline. Figure - (click to enlarge) Lower SES adults exhibit reduced segregation of their resting-state functional brain networks and lower mean cortical thickness in middle-age adulthood. For each age group, brain system segregation (A) and mean cortical thickness (B) are plotted for higher and lower SES (stratified using a median split across the entire participant sample; error bars depict standard error of the mean). Higher SES is associated with greater brain system segregation and mean cortical thickness in middle-age groups (ME, 35–49 y; ML, 50–64 y). Primary statistical models were completed using general linear modeling, where SES was modeled continuously.